In listening to news commentary this morning, I heard a question asked regarding the charges against General Flynn that I had not considered. If the FBI had transcripts of General Flynn’s conversation with Sergey Kislyak, the Russian ambassador to the U.S, why did they need to interview General Flynn? First of all, General Flynn’s civil rights were violated when he was unmasked as the person in that conversation–a law was broken. Secondly, if General Flynn broke a law somewhere in that conversation, why not convene a Grand Jury, charge him, and sentence him? The answer is becoming obvious. Keeping the investigation and charges against General Flynn in the news is damaging to President Trump (that may be temporarily true, but I suspect at some point the media and deep state may overplay their hand). Those responsible for this travesty are bragging about their actions. Yesterday CNS News posted an article about some recent comments by former FBI Director James Comey. Former FBI Director James Comey, speaking to an appreciative audience in New York on Sunday, told NBC’s Nicole Wallace that he sent two FBI agents to visit then-National Security Adviser Mike Flynn at the White House on January 24, 2017, because he figured he could get away with it. 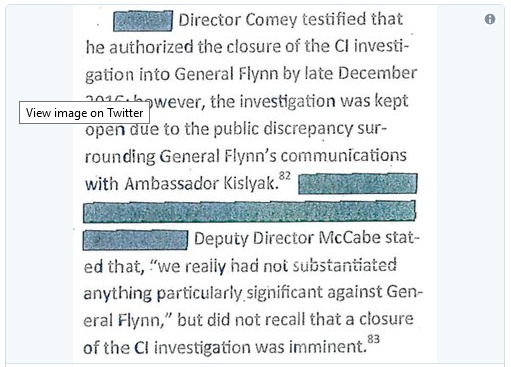 General Flynn is not the person who should be getting ready to be sentenced. In less than four weeks, the Democrats will take control of the House of Representatives. So what can we expect before than happens? I don’t mean to be cynical, but I suspect we will see the illusion of motion while very little is actually accomplished. 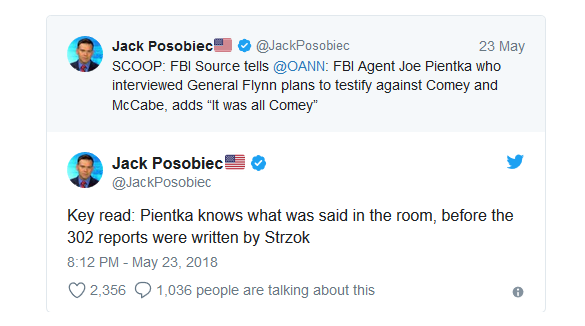 The Gateway Pundit posted an article today about James Comey’s testimony before the House Oversight and Government Reform Committee concerning the investigation into Hillary Clinton’s email server and the irregularities in the FISA applications that allowed the Justice Department to spy on the Trump campaign and later the Trump administration. FOX News Catherine Herridge reported that a DOJ attorney is telling Comey not to answer questions. They may have to call Comey back in for more questioning. The Republicans in the House have maybe two working weeks before losing control of the House. Does anyone honestly believe that Comey will answer pertinent questions about these matters in that time? Does anyone honestly believe that the Democrats will ask these questions after they take control of the House? I don’t know why the Republicans have avoided dealing with this previously. I do know that this looks very much like they wanted to look like they were doing something without actually accomplishing anything. I think a lot of voters are getting very tired of that method of doing business. In an astounding New York Times piece by David Samuels, senior White House officials gleefully confess they use friendly reporters and nonprofits as public relations tools in the selling of President Obama’s foreign policy — and can do it almost at will because these tools are ignorant, will believe what they’re told, will essentially take dictation and are happy to be used just to get the information necessary for a tweet or two. Their greatest triumph, according to Samuels, was selling a misleading narrative about the nuclear deal with Iran — the parameters of which were set a year before the administration claimed and which had nothing to do with the fact that a supposedly more accommodating government had risen to power. The mastermind of the Obama machine is Ben Rhodes, a New Yorker who joined the Obama campaign as a speechwriter in 2007 and has risen to become the most influential foreign-policy hand in the White House. Rhodes drips with contempt for almost everyone but his boss. He consigns all those who do not share every particular of the Obama-Rhodes foreign-policy perspective to a gelatinous mass called “The Blob” — including, Samuels writes, Hillary Clinton. I have previously written an article about this New York Times piece. However, as the media panic over ending the Iran deal continues, I would like to add a few thoughts to the discussion. First of all, many of the Democrats now yelling that the sky is falling because President Trump pulled out of the deal did not support the deal in the first place. The Iran deal was never given to the Senate as a treaty because the Obama Administration understood that it did not have the votes to pass. So I am not sure if the work of Ben Rhodes was actually successful–the treaty (or non-treaty as it was) never really gained majority approval. It was, Samuels says, a deliberately misleading narrative. The general terms were actually hammered out in 2012 by State Department officials Jake Sullivan and William Burns, rooted in Obama’s deep desire from the beginning of the administration to strike a grand deal with the mullahs. Would a Hillary Clinton presidency have been any different?